When someone raises their hand and takes an oath to become a firefighter or EMS professional, they knowingly assume the risks associated with one of the nation’s most dangerous professions. Very few young firefighters think about the future in terms of needing a pension and/or disability benefits. There are almost 3,000 public sector pension plans across the United States providing retirement and disability benefits to over 350,000 career fire service and EMS employees. While benefits vary widely depending upon jurisdiction, priorities and resources, most firefighters enjoy a defined benefit-style retirement plan. This means that, unlike a 401(k) or IRA, a firefighter is assured a specific, well-earned benefit when they retire, either after a job-ending injury or they simply hang up their gear for the last time. Defined benefit plans afford security and allow our members to retire with dignity and a measure of self-sufficiency in their golden years. These benefits have never been provided because of a jurisdiction’s largess or their desire to be firefighter-friendly. They are not a “gift” from your employer. Generations of fire service labor leaders have negotiated, lobbied and bargained hard to win our retirement security. In many cases, firefighters have forfeited pay increases to fund their retirement benefits. ESG Investing For Public Pensions: Does it Add Financial Value? public sectors. The Institute for Pension Fund Integrity (IPFI), which focuses on fighting for fiduciary responsibility in public pension funds, believes that it is important to investigate the merits and potential scope of ESG investment, particularly when it comes to our nation’s public pension systems. IPFI firmly believes that the primary duty of a fiduciary is to ensure the financial stability of the funds with which they are entrusted. Fiduciaries should not be motivated by politics, ideology, or any other extrinsic force…. To read the full white paper and learn more about IPFI’s stance on ESG investing, please click below. FOR IMMEDIATE RELEASE: ESG Investing for Public Pensions: Does It Add Financial Value? ESG Investing for Public Pensions – Does It Add Financial Value? Former Connecticut Treasurer and IPFI President, Christopher Burnham, discusses the current state of the pension system with other experts, focusing on the increased use of ESG investment. Washington, DC – The Institute for Pension Fund Integrity (IPFI) released its latest research on Tuesday, September 25, 2018. In the wake of the Trump Administration’s renewed guidance on environment, social, and governance (ESG) investing in the April 2018 Department of Labor Field Bulletin, IPFI felt it important to analyze the impact of ESG investing on public pensions. While the DOL guidance applies to private sector pensions, ESG investing is growing in popularity in both the private and public sectors, and it is important to understand the role it plays for public pensions. Public pensions across the country face more than $6 trillion dollars in unfunded liabilities. Therefore, while some investing strategies are seen as more popular than others, it’s important for public pensions to focus on the returns gained to begin closing the gap. In the latest research by IPFI, the organization details how ESG investing differs in the public sector versus in the private sector. ESG has shown to add value to private investments, but in the public sector it ultimately comes down to the question of if ESG investments add financial value. Much of the research is still undecided on the impact of ESG investing on public pensions given the propensity for ESG investments to be made based on political, not financial, decisions. In the public sector, investment decisions should never be made based on the political impact of an investment. At the panel, Mr. Burnham said, “ESG investing is valuable when it adds bottom-line performance to a pension. But it’s not the role of our public pension fiduciaries to make decisions based on what they think is good for society. 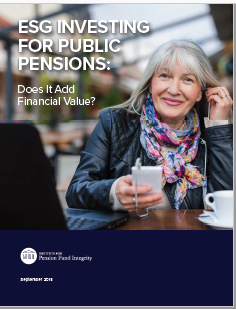 Instead, they must make investment decisions based on one factor, and one factor only: does it add alpha?” This thinking supports IPFI’s other efforts given its goal to keep politics out of the management of public pension funds. This research and discussion comes as we reflect on the 10 years since the Great Recession. Considering that public pensions were almost 90% funded before the Recession and on average are now 68% funded, the impact of all investment decisions, whether ESG or otherwise, will be felt by retirees for decades to come. Forbes Column by Chris Burnham: What Does Being A Fiduciary Really Mean? The Latin word, fidelis – “faithful” – however, is not the sole property of the USMC. In fact, 800 years before the founding of the Marine Corps, English law used it as the basis of the word, “fiduciary,” or someone who will faithfully manage the property of warrior knights while they were off fighting, so that when they returned, they could be assured that the integrity of that property was maintained to the best ability of the appointed trustee. Maybe it is time to take away fiduciary responsibility from our state and local pension managers and the politicians responsible for them, and subject them all to the same ERISA law that corporate and union managers must abide by. Corporate pension plans always outperform pulbic pension plans. Interesting, isn’t it? Arlington, VA – The Institute for Pension Fund Integrity (IPFI) is a non-profit that focuses on strict adherence to fiduciary duty by public pension fund leaders, keeping politics out of public pension fund management, bringing market-based assumptions to the calculation of public pension unfunded liabilities, and providing pension beneficiaries and policy leaders all the facts and transparency needed to make the best informed and rational decisions. IPFI is excited to announce its new advisory board, comprised of members from across the political spectrum who are passionate about keeping politics out of the management of public pension funds. The board members have deep backgrounds in public service and pension fund management and will provide guidance and gravitas to the organization. Kevin O’Connor, former Assistant to the General President of the International Association of Fire Fighters (IAFF), elected trustee of the Baltimore County Employees Retirement System, and founder of O’Connor CARES Solutions. The IPFI Advisory Board will help provide bipartisan direction to the organization. There is a growing awareness in recent years of the massive unfunded liabilities in public pensions – but that’s only the beginning of the story. There has been an increased push to allow politics to dictate investment decisions through divestment movements. In addition, public pension funds frequently allow politics to drive the adoption of unrealistic assumed rates of return and outdated mortality expectations, in order to reduce the amount that the state or local government must contribute to the fund annually. The Board Members will add their voices to the growing chorus of opposition to the politicization of pension funds. For more information on IPFI or the Advisory Board, please visit www.ipfiusa.org/leadership. On July 12 it was reported that the government of The Republic of Ireland would become the first country in the world to sell off its investments in fossil fuel companies. The divestment bill passed through the lower house of parliament with all-party support and will require the $9.3 billion National Investment Fund to sell its investments in coal, oil, gas and peat “as soon as is practicable.” This divestment action, one that will cost the government of Ireland millions in frictional costs and re-investment fees, came at the behest of an environmental movement aimed at decreasing the financial position of major fossil fuel companies. This type of action is unacceptable to IPFI and our President Christopher Burnham. Political decisions such as this one do not put the needs of the fund at the forefront of decision-making. The Republic of Ireland ranked recently as the second worst European county for climate action. This ranking undoubtedly drove leadership to make this hasty and ill-informed decision. The divestment action is being heralded as a blow to fossil fuel corporations and their value- but this is not the case. When an entity chooses to divest holdings, the company divested from does not lose value, as shares are bought on a secondary market by investors not holding the same qualms as the original stockholders. By divesting, The Republic of Ireland has lost its ability to engage leaders at shareholder meetings, leaving the fund instead with fewer holdings (less diverse funds are less risk averse funds) and millions to reinvest in less-proven industries. This political maneuver was ill-advised and as an organization that exists to keep politics out of the management of public funds, IPFI cannot condone this action. A secure retirement built on a strong pension has always been the ultimate reward and “thank you” for a lifetime of service by our public servants. Unfortunately, massive unfunded liabilities in pension systems across the country threaten that security. This is not only because of chronic underfunding, but also because of politically driven calculations. Now, if we let them, Mayor de Blasio and City Controller Scott Stringer will inject a whole new level of politics into the management of New York City’s public pension funds by making arbitrary and political decisions regarding what the funds should or should not invest in. In the latest movement to force political agendas into the management of public pension funds, de Blasio and Stringer proposed in January 2018 to divest $5 billion in energy stocks from the city’s pension funds. Notwithstanding that natural gas, gasoline and diesel keep the city running and the economy moving, the elected officials want their personal political agendas to replace “the highest standard of care” that their fiduciary duty requires them to provide to the pension beneficiaries. Using the optimistic, and politically advantageous, 7% protected rate of return, New York City faces at least $60 billion in unfunded pension liabilities. If the rate of return is reduced by just 1%, the unfunded liability jumps to over $90 billion, which would increase contribution requirements for the city. For context, $10 billion of NYC’s annual budget now goes towards pension costs, which is more than seven times the average total budget of America’s 100 largest cities. This leaves the city with the difficult choice of deciding how to sustain this funding, and the pension board with the duty of deciding how to manage the unfunded liabilities. It’s against this backdrop that de Blasio and Stringer now propose putting politics over fiduciary duty. In order to advance their costly energy divestment plan, de Blasio and Stringer issued a “request for information” to inform their plans, even at a time when not all five pension funds support the divestment scheme. In response to the request, the Institute for Pension Fund Integrity, which I lead, highlighted that New York City stands to lose $25 million immediately in frictional costs, and up to $1.5 billion over the next 50 years if it goes ahead with this plan. The energy divestment scheme continues a long history of divestment campaigns, which experts have assessed have never resulted in increased value for pension plans. Divestment movements have included everything from tobacco (like when I was Connecticut treasurer) to divesting from companies that boycott Israel (like in Illinois). These divestment movements are actually contrary to IRS guidelines that require diverse plan investments. This document provides a high-level, side-by-side comparison of the four pension funds paid into by the City of Chicago and the two pension funds paid into by Cook County, Illinois. Data is chiefly drawn from the actuarial valuation reports issued for each fund as of December 31, 2016. Arlington, VA – The Institute for Pension Fund Integrity (IPFI), a non-profit organization which seeks to ensure that state and local leaders are held responsible for their choices in public pension investment, responded today to the New York City Comptroller’s request for information (RFI) regarding how to divest city pensions from energy company holdings. IPFI’s fundamental goal is to keep politics out of the management of pension funds and the RFI response details the detrimental cost that divestment would have on NYC’s already underfunded pensions. By calling for divestment from energy holdings, NYC Comptroller Scott Stringer and Mayor Bill de Blasio are clearly pushing a political agenda which contradicts their fiduciary duty to maximize returns with a reasonable risk. The divestment of about $5 billion in assets invested in over 190 energy companies would reduce plan diversity and is estimated to negatively affect plan returns. Experts have assessed that divestment campaigns have never resulted in increased value for pension plans. Over the next 50 years, New York stands to lose $1.515 billion from their pension funds if they divest from energy holdings. In the RFI response, IPFI emphasizes that divestment is an irresponsible course of action that will politicize pension funds, undermine the financial health of the pension fund, and violate the fiduciary responsibility of fund management. Divestment will not “protect the long-term interests of the Systems’ beneficiaries, “as the RFI claims, but will simply expose police officers, teachers, firefighters, other pensioners and the taxpayers to unnecessary financial risk. For more information about IPFI’s position and to read the RFI response, please click here. For a recent presentation on IPFI’s mission, click here.